Spring is coming, but it’s not here yet, and we’re still blasting the heat to stay warm inside. While you still need that warm air to survive out here in Colorado for a few more weeks, you can start warming up your home without the thermostat by using paint instead. I know what you’re thinking. Simply painting a wall a different color has no effect on the temperature of a room. And you’re right. Painting a picture of a flaming log doesn’t light an actual fire. The effect is psychological. If you wake up every cold morning to a warm-toned bedroom, you won’t mind putting on your slippers and robe and starting your day. When you wake up to a cold, dark room, your first thought is usually, ‘wow, I’m cold and I don’t want to get out of bed.’ I haven’t conducted a scientific test on this subject, but I can tell you from personal experience that a warm interior color tone at least takes my mind off the fact that I need to turn up the thermostat. 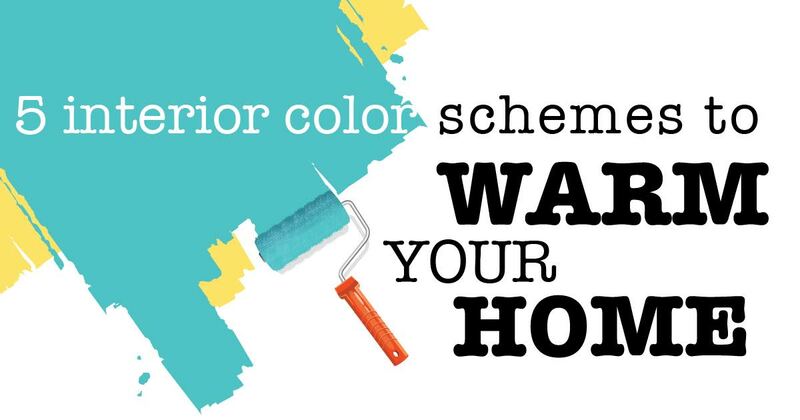 So, take a look at these colors for your interior to try and warm yourself up without blasting the heat. White tones are thought of as the ‘default’ color for most interior rooms. Many people think of creamy white or off-white as boring or uninspired. The key is getting the perfect white for your interior space. An off-white hue can be the perfect backdrop to your interior living room décor; a creamy white can refresh your living room look. What all white hues have in common is that they convey a warm, bright feeling, taking your mind off the still-cold weather outside. Yellow is the color your kids use when they draw the sun for you, so it’s no surprise that a yellow hue is on this list of warm colors. Mustard yellow in particular can play up the color in your interior space, highlighting your other interior décor. While you might be hesitant to paint a room bright yellow, mustard is a good, muted-but-still-warm alternative. Again, bright red is not for everyone, but a deep, rich red can invoke fire imagery and feelings in your home without burning anything. A rich red is a prime candidate for the color of an accent wall if you don’t want to commit to an entire red room. I know. Blue is usually associated with cold, but the right blue can actually warm a room. The key is to find a soft, light blue that emulates the sky on a perfect summer’s day. This color can be especially effective at providing a warm feeling in rooms that get more outside light than the others. What separates tangerine from regular old orange is that tangerine paints are usually richer with more yellow mixed in. Tangerine soaks in the outside light and uses it to warm you inside your home. These colors are great places to start if you want to start spring a little early this year.